I’m not a gadget person. Rechargeable or not, batteries annoy me. When I express interest in a gadget, I usually get it because a) I don’t ask for a lot of gadgets and b) my husband likes to buy gadgets. He also likes to buy jewelry. No, he’s not available. I was already organizing recipes on my computer using Evernote, and not being one to print a lot, I would bring my laptop into the kitchen if I was making a recipe that I had stored in Evernote. I had a couple of near-miss-messes and knew that it wasn’t a great idea to fling flour and splatter butter near my laptop. Then came the iPad. Then came Evernote for iPad. I had to have an iPad! I got one for my birthday! I love using it in the kitchen! I researched stands and didn’t like any of them. One idea that kept popping up online was a really cheap plastic business card holder. 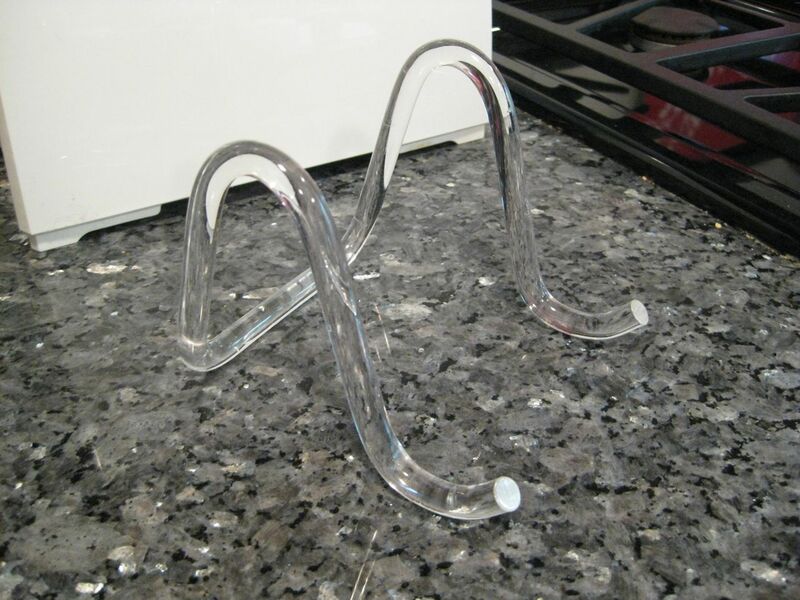 I looked around the house to see if I had something similar and found a plastic stand – I’m not sure what you’d call it – it’s sort of an easel or a plate stand. I was using it to display a doodad. It worked perfectly, so I put the doodad away and now it’s in its second life as an iPad stand. It’s easy to clean the iPad, so I don’t worry about touching the screen with a dirty finger. (Um, I probably should have cleaned it before I took the photo above, but oh well.) I would not want to touch the buttons on the top or front with a drippy or really dirty finger, but that’s easy enough to avoid: I set the auto-lock setting (that’s like a sleep setting) to Never. That way, my screen doesn’t go black at a critical moment. That said, just because I haven’t had an accident doesn’t mean it can’t happen. I did see something online that said you can put the iPad in a large zipper bag and the touchscreen will work through the bag. Something to keep in mind if you want some extra protection. No iPad? You should still check out Evernote. You don’t need an iPad or any other mobile device to use it. It’s free. It’s awesome for organizing recipes, other web content, and all kinds of list-making. Note: As you may have guessed, Apple did not ask me to endorse their product, nor did Evernote. I just upgraded to a Mac (I thought about the Ipad) – but I have to admit your setup is really, really cool. 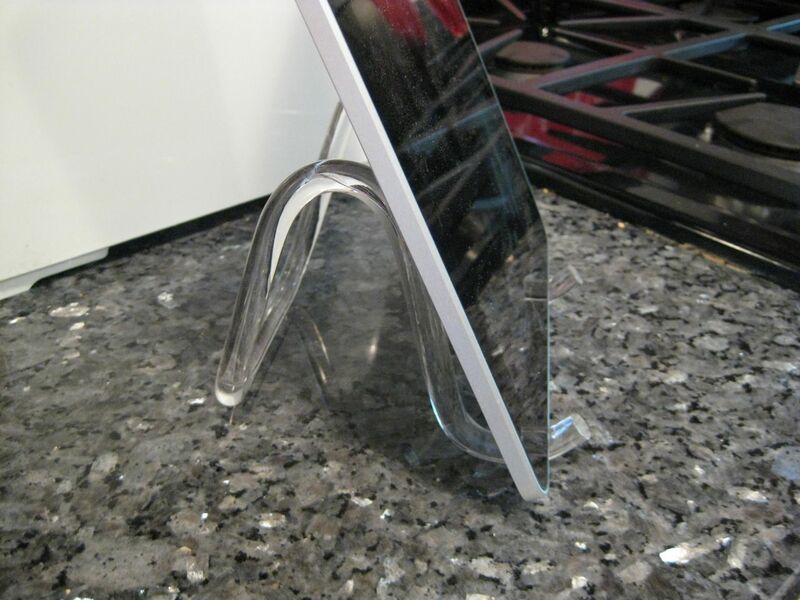 I love the iPad in the kitchen! We use the epicurious app a lot. I’ve also started storing some of my recipes in the one tsp website, but that takes work up front. I tend to use de.li.cious as a repository for all the recipes I want to try on the web. Would evernote work on digital magazines? I’m starting to electronically subscribe and need to find the electronic equivalent to the post it note. I’m not sure how digital magazines work, but it’s worth a try. I have the Epicurious app too – I haven’t done a lot with it yet, but it’s really nice! What a great set-up! We’re pretty low-tech here (I don’t even have an iPhone or a laptop), but I’m kind of intrigued with the iPad. 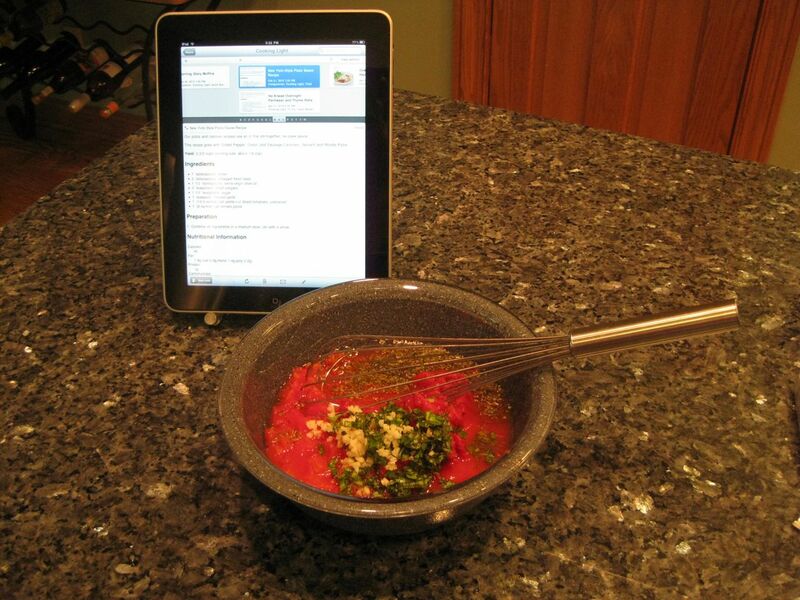 Evernote sounds really useful; I can definitely use help organizing my recipes. Thanks for the suggestion. I’ll be sure to check out Evernote! What a cool idea! Now I want an iPad. I have never heard of Evernote, but I must check it out. Jealous! Okay…I don’t even have a laptop yet! Sad, right? I did get a iPod touch (32GB) for my birthday, but I am so wanting that iPad!! Enjoy! I’m resisting the iPad until the next release, but you’re making it harder! Congrats on your new gadget! I have been debating getting an Ipad since I already have a kindle and a netbook, but this looks like a great way to use an Ipad. Very clever!! I didn’t really need one more reason to get an iPad but now I have one. Also checking out the Evernote. I haven’t heard the word “Doodad”in a LONG time-LOVE it. Congrats on your Ipad! It seems like SUCH a cool tool!